**Special rate for 2 nights April 8 - May 22, 2019, 2 night minimum, based on double occupancy. See below for additional info regarding conditions and fees. ***Lowest rates (non specials) apply only in certain seasons and for stays of 3 nights or more, where there are currently open dates available on our calendar during that season. All posted rates are based on double occupancy. Extra Person charges apply for more than 2 people staying in the suite. Additional fees also apply: Out-Cleaning, Daily Resort Fee, PDI, plus state and local taxes must also be paid. This serene, top-floor, Ocean View, Penthouse style, luxury suite at Kauai's Waipouli Beach Resort & Spa features 2 King Size Master bedrooms and 2 3/4 Master baths, exquisitely accented with warm Indonesian woods and cool Peruvian tile. Each bedroom offers it own master bath with custom marble and tile bath surrounds, with double sinks, over sized soaking tub and walk-in shower. Your king-size canopy four-poster 'Heavenly Bed' beckons with luxurious linens, and down filled duvets. The spacious, fully-equipped, gourmet kitchen features granite counters and stainless steel cookware and appliances by Sub-Zero, Wolf and a Bosch Ascentia Dishwasher and full size Samsung Washer and Dryer. Dine al fresco on the lanai table and chairs with views north and east views of the ocean and mountains. Vaulted ceilings in living room, climate control, free resort WiFi, and a 42-inch plasma screen HDTV complete your luxury get-away. Stroll to the sandy beach or enjoy the unique, heated pool that meanders over two acres with waterfalls, romantic grotto's, and water slides. While at the resort you can enjoy your home away from home in luxury: Soak in one of the three sand-bottom hot tubs/spas, relax at the poolside with your favorite drink, or enjoy the fusion/eclectic Pacific-Rim, locally-sourced beachfront Oasis Restaurant and Bar. A fitness center has recently been completed so guests can enjoy working out at poolside. Whether a couple or a family, this spacious unit will comfortably accommodate the most discerning of travelers. For the Discerning Traveler: Ocean Bike Path along coconut coast: A beautiful ocean bike path has been built for enjoying the coastline's breathtaking views, currently extends to almost 9 miles of paved path. Bike rentals along route available, affordable and easy to access. We will be happy to assist you with any events, activities, that you would like to enjoy on our beautiful garden island of Kauai. We will be happy to offer suggestions or help to your inquiry. Well light, over sized bathrooms, with luxurious over sized tubs. We have spa treatment & romantic amenities packages that can be purchased for special events such as weddings and anniversaries to have ready in your unit before you enter. Maile' Spa Amenities like shampoo and conditioner are provided in each master bath. Beach is about 120 feet from unit. You can also see small mountain views from Lanai. Full size new Samsung stacking Washer/Dryer Combo. Free Resort Wifi included with your Stay. Elevator is located in building C, it is connected to B building and is a short walk away. 42' Plasma Screen TV and sofa, chair. Spices, Oil, Salt, Pepper, Plastic, and storage for food items. Non-Perishable type items. Fully equiped gourmet kitchen, features granit counters, stainless steel cookware, Sub-Zero, Wolf, G. E., Bosch, and Cuisinart, appliances. Nearby Golf Resorts offer some of the most spectacular ocean views while enjoying play. The entire property is now a 'Non Smoking Facility', smoking only permitted at locations by street. $1,000.00 fine if found smoking on property or in unit that will be paid by guest. Beautiful suite in a beautiful resort! This was the perfect place for our family to stay while in Kauai. The suite is spacious and beautiful. The kitchen was stocked with all the basics we needed, the beds and linens were clean and comfy. We loved the amazing pool area complete with a "lazy river" and water slides. The resort is close to grocery stores, shops, and restaurants which was great! A basket of fresh Hawaiian produce and snacks was waiting on the counter for us when we arrived and that was a wonderful and unexpected surprise after a long day of travel. Thank you Ron for everything!!!! The condo was well appointed and perfect for our family of 5. Everything that we needed for our 10 day stay was provided plus some extras for the kids that made it perfect. The property was better than the pictures and centrally located to all areas of the island. Ron was a pleasure to work with and checked on us to make sure we had everything that we needed. We would highly recommend this property and will be coming back to stay in this spacious and comfortable condo. Beautiful condo, easy central location, well-stocked and thoughtful touches. Would definitely recommend. And Mr. Gunn makes everything so smooth and easy. The resort grounds are beautiful, especially the pools. The condo was very comfortable inside. Excellent beds. Kitchen is nicer than mine at home. Bathrooms were very nice. Whole condo very well appointed. Nice view from the lanais. Ron was very responsive and helpful. Nice property. Beautiful condo. Stayed 4 days. Short driving distance from everything we wanted to do. Absolutely stay there again. 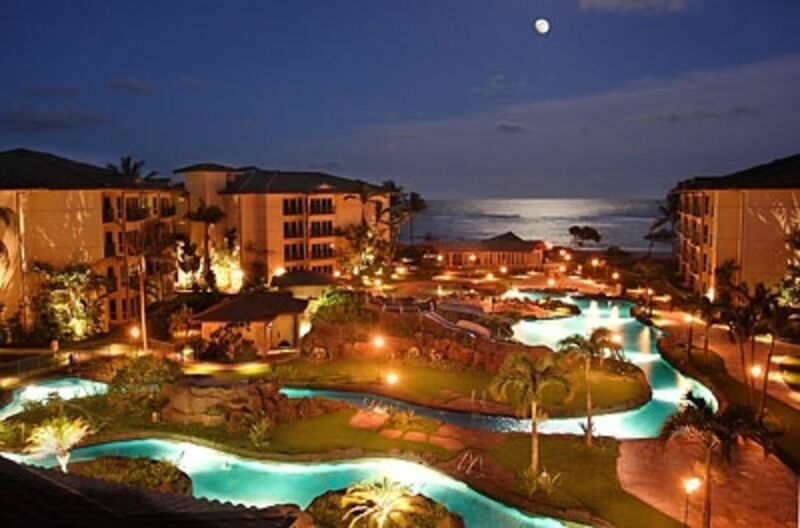 Waipouli Beach Resort & Spa is a stunning luxury resort located on the Eastside of the island of Kauai. This magnificent luxury resort is considered the crown jewel of the Coconut Coast. It is located 10 minutes north of the airport, yet walking distance to all activities and restaurants in nearby Kapaa/Waipouli. Golf: World renoun golf in magnificent settings. Poipu Bay, home of the Grand Slam. Other courses are Puakea, Kiahuna, Kauai Lagoons, Makai and Prince Golf on the north shores. Rates quoted based on double occupancy & subject to change. Payment due in US funds and subject to additional fees based on origination country. International Processing Fees will apply! All bookings subject to $20/day resort fee. Additional charges may apply. All guests names must be registered and listed on Rental Agreement. Hawaii State Tax ID # 84565142-01. See Cancellation policy for details.